Sector investing can be a powerful tool in providing investors with opportunities to fine-tune or manage risk in their portfolios. It is rare for any single sector to be a consistent top or bottom performer year over year because different sectors tend to perform differently in various market conditions. Investors may choose to invest in certain sectors that they believe will outperform the market or choose to avoid certain sectors that they believe will underperform the market. 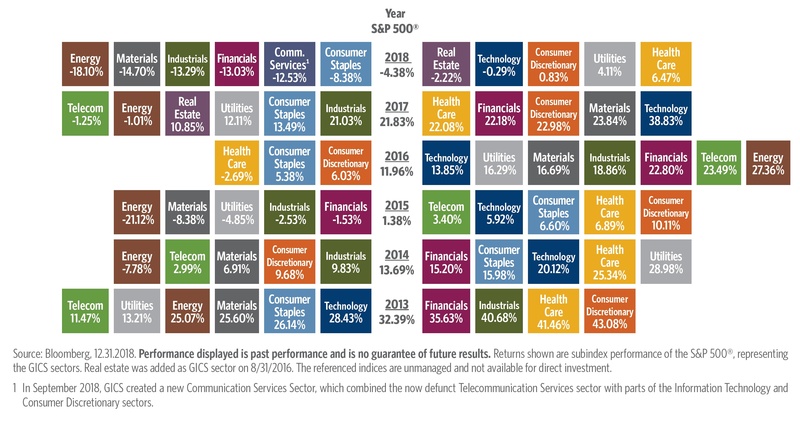 Figure 1 shows how sectors have performed relative to the S&P 500 since 2013. Note: Performance displayed is past performance and is no guarantee of future results. Returns shown are subindex performance of the S&P 500, representing the GICS sectors. Real estate was added as a GICS sector on Aug. 31, 2016. The referenced indexes are unmanaged and not available for direct investment. 1 In September 2018, GICS created a new Communication Services Sector, which combined the now defunct Telecommunication Services sector with parts of the Information Technology and Consumer Discretionary sectors. Understanding sector exposure and construction has perhaps never been more important given the major sector changes that were introduced by the Global Industry Classification Standard (GICS) in September 2018—changes that resulted in 1,000 companies being reclassified globally. According to Morningstar, there are approximately 800 available sector funds and ETFs (as of Dec. 31, 2018), so it may be a challenge to choose a sector fund that matches the needs of specific portfolios. Sector fund construction can vary significantly based on how companies are classified, whether they include global and/or domestic stocks, and which capitalization ranges might be included (large, mid, and/or small). With the emergence of smart beta and alternative weighting approaches, the weighting of stocks within a sector fund can vary significantly. These different sector classifications, inclusion strategies, and weighting approaches may cause performance among sector funds to vary substantially. That is why, before investing in a sector fund, it is important to understand the methodology employed. Market sectors are a way to classify different stocks into common groups that may perform similarly in certain economic conditions. There are a number of different sector classification systems, which classify companies based on different criteria such as the markets served, revenue sources, or the products/services offered. GICS is one of the most well-known sector classifications, but a few other popular ones include Industry Classification Benchmark (ICB), Bloomberg (BICS), and FactSet Revere Business Industry Classification System (RBICS). As Table 1 illustrates, a company’s classification can vary depending on the sector methodology used. Facebook and Alphabet moved to Communication Services from Information Technology. Netflix and Walt Disney moved to Communication Services from Consumer Discretionary. EBay moved to Consumer Discretionary from Information Technology. These sector changes underscore the need to understand how a sector strategy classifies companies. Certain companies, particularly ones with well-diversified lines of business or ones in emerging technologies or industries, can be difficult to pin down. Guggenheim’s philosophy on classification is that sector portfolios should be reflective of the broad economic performance of specific sectors. If a company is integral to the economic performance of more than one sector, then it should be included in all of the relevant sectors. For example, Amazon.com has a significant impact on retail, a strong online presence, and offers internet hosting services and web-based data and services. The case can be made for including Amazon.com in both retailing and internet sector funds, as Guggenheim does. GICS classifies Walmart and Target in different sectors (Walmart in Consumer Staples and Target in Consumer Discretionary). However, both of these companies compete directly in retail, and, accordingly, Guggenheim includes both Walmart and Target in the Rydex Retailing fund. Sector categorization is the broadest way to deconstruct sectors, but there are many other considerations, such as geographic exposure (global, domestic, region-specific) or capitalization factors (large-, mid-, small-cap stocks). In today’s globalized economy, as firms grow larger, it’s not uncommon for them to become more and more exposed to markets outside of the United States. A case in point is the S&P 500 Index, one of the most common benchmarks for U.S. equities. On average, 31% of the revenues in the stocks in this index are driven by markets outside of the U.S. (as of Dec. 31, 2018), according to FactSet. FactSet also reports that nearly a quarter of index members earn less than 50% of their revenue domestically, demonstrating that even this well-known benchmark composed of U.S. stocks has a considerable global footprint and exposes investors to international markets. Guggenheim believes it makes sense to look at sectors in holistic terms and include global exposures through international stocks that trade on U.S. stock market exchanges, such as American Depositary Receipts (ADRs). For example, including Unilever in the Consumer Products sector and Novartis in the Health Care sector may provide a truer sector exposure than excluding them. Guggenheim includes international stocks in its sector classifications because it believes that a global frame of reference can be beneficial to help create a purer sector definition. Does company size—large, mid, or small—matter? In traditional sector portfolios, stocks are weighted by market capitalization, which can result in overweighting or dominance by the largest stocks. In the past decade, smart beta has become a popular way to create investment strategies for many areas of the market, including sectors. Smart beta generally refers to any strategy that differs from a conventional market-cap-based weighting. Some sector funds use equal weighting to limit the size bias. Others may use factor weighting techniques, such as dividend yield or momentum scores, to weight stocks. Cap-weighting provides a representation from a business landscape perspective, with larger stocks getting larger weights, whereas equal weighting provides a good representation of an investor’s opportunity set with all stocks equally able to contribute to performance. Guggenheim’s modified cap-weighted approach, which, in general, takes the square root of each company’s market capitalization, acts as a midpoint between these two perspectives, allowing the market leaders to retain the most influence without unduly dominating the sector and negatively impacting diversification. For more than 15 years, Guggenheim has used this approach as a basis for its Rydex sector funds because we believe it reduces stock-specific risk and broadens sector exposure. Table 3 shows a hypothetical example of the differences in weights between the top 10 S&P 500 Energy Index allocations, based on market capitalization, equal weight, and modified market-capitalization methodologies. Not all sector ETFs and funds are the same and can differ substantially in their market-cap breakdown, international exposure, style exposure, and weighting. All of these factors impact performance and how the sector strategy will be integrated into the overall client portfolio. Understanding the nuances of a sector fund’s security selection process can result in a better outcome for meeting portfolio risk-return objectives. This material contains opinions of the author, but not necessarily those of Proactive Advisor Magazine or Guggenheim Partners LLC or its subsidiaries. The opinions contained herein are subject to change without notice. Forward-looking statements, estimates, and certain information contained herein are based upon proprietary and nonproprietary research and other sources. Information contained herein has been obtained from sources believed to be reliable, but are not assured as to accuracy. Past performance is not indicative of future results. There is neither representation nor warranty as to the current accuracy of, nor liability for, decisions based on such information. No part of this material may be reproduced or referred to in any form, without express written permission of Guggenheim Partners LLC. Investing in sector funds is more volatile than investing in broadly diversified funds, as there is a greater risk due to the concentration of the funds’ holdings in issuers of the same or similar offerings. The funds may invest in American Depositary Receipts (“ADRs”) therefore subjecting the value of the funds’ portfolio to fluctuations in foreign exchange rates. The funds are subject to active trading risks that may increase volatility and impact the fund’s ability to achieve its investment objective. The funds are considered nondiversified and can invest a greater portion of their assets in securities of individual issuers than more diversified funds. As a result, changes in the market value of a single security could cause greater fluctuations in the value of fund shares than would occur in a more diversified fund. The GICS® is an industry taxonomy developed by MSCI and Standard & (S&P) in 1999 for use by the global financial community. The GICS structure consists of 11 sectors, 24 industry groups, 68 industries, and 157 sub-industries into which S&P has categorized all major public companies, according to the definition of the principal business activity. The referenced funds are distributed by Guggenheim Funds Distributors LLC. Guggenheim Investments represents the investment management businesses of Guggenheim Partners LLC (“Guggenheim”), which includes Security Investors LLC the investment advisor to the referenced funds. Guggenheim Funds Distributors LLC is affiliated with Guggenheim and SI. This is an updated version of an article that was published on Oct. 24, 2018. Ryan Harder, CFA, is a managing director and portfolio manager at Guggenheim Investments. He leads a team of portfolio managers responsible for managing tradable Rydex funds, as well as select alternative funds. He is a member of the investment leadership team and sits on the credit review committee. Adrian Bachman, CFA, is a portfolio manager at Guggenheim Investments. In addition to managing portfolios, Mr. Bachman conducts research on various quantitative equity strategies.